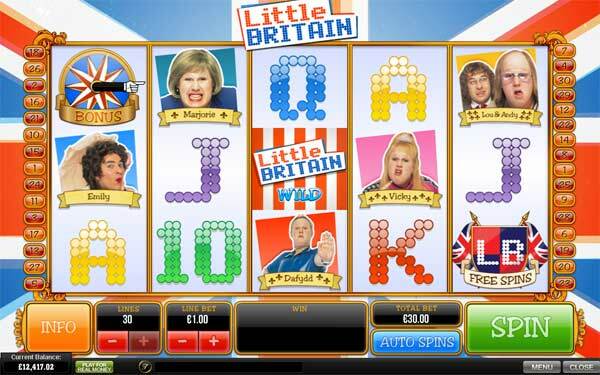 People have been waiting for this game to be released in online casinos for many years, the wait is over Little Britain Slots have arrived and you can play the game FREE right here. This game is so much fun as you get to know the great characters like Vicky Pollard, Marjorie Dawes and Emily. The game is packed with bonus features and contains real clips from the cult UK TV series. The 30 paylines offer wilds, scatter bonus and free spins symbols. Get 3 FREE SPINS symbols and you get 10 free games with expanding animated characters acting as wild symbols. There is a random wild feature when Anne appears on screen and will throw cream cakes at the symbols and turn them wild to win you extra cash. 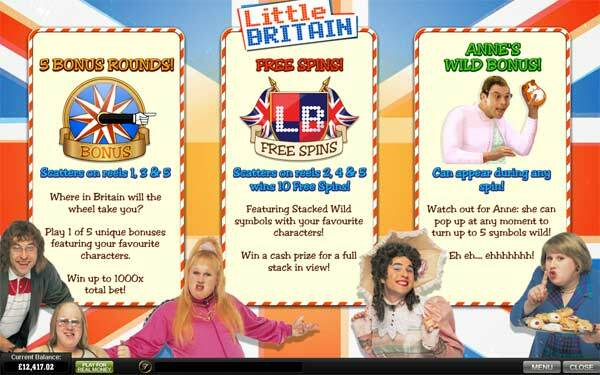 There is also the Little Britain bonus wheel that will open one of 5 bonus features. Vicky Pollard ASBO Bonus - choose activities, like joyriding, to win bonus cash. Marjorie Dawes Fat Fighter Bonus - reveal the food on the trays and try not to fill the calorie meter, low calorie items like 'dust' win you more. Lou & Andy's Live It Bonus - what does Andy like? Lou must give Andy items that he likes to win up to 1000 you total bet. The game offers a great payout system that can win heaps of cash and is great fun to play with real video and sound clips, you will be laughing all the way to the bank.